1. 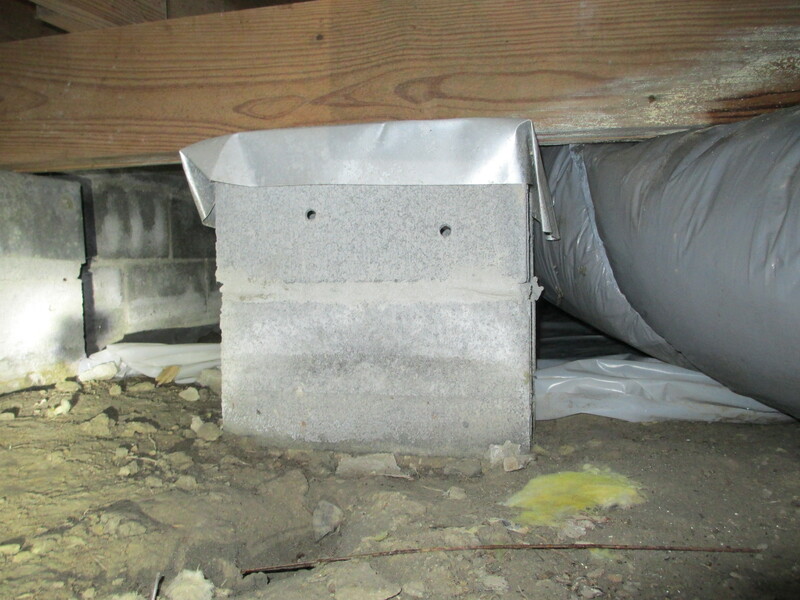 Ensure your crawlspace has a termite shield (a metal barrier placed over the blocks that the sill-plate sits on). 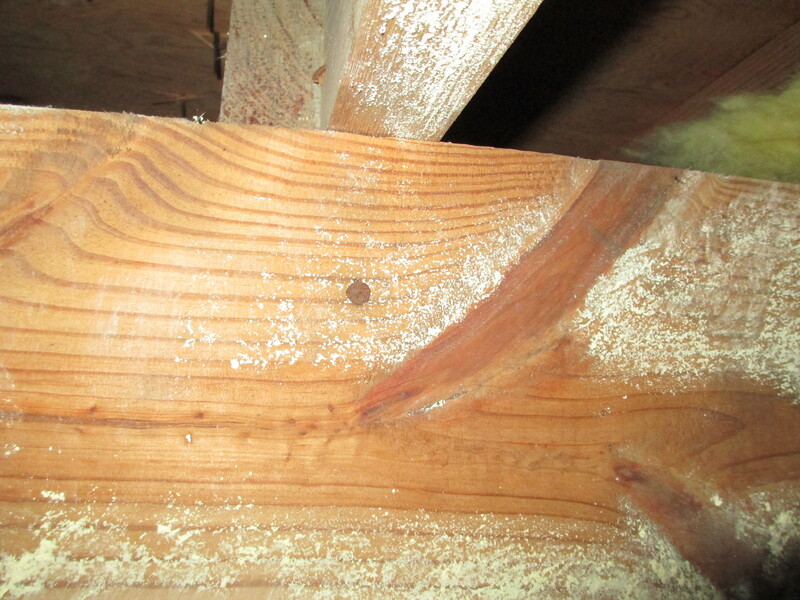 This termite shield is designed to cover the blocks and angles slightly down in the interior of the crawlspace. 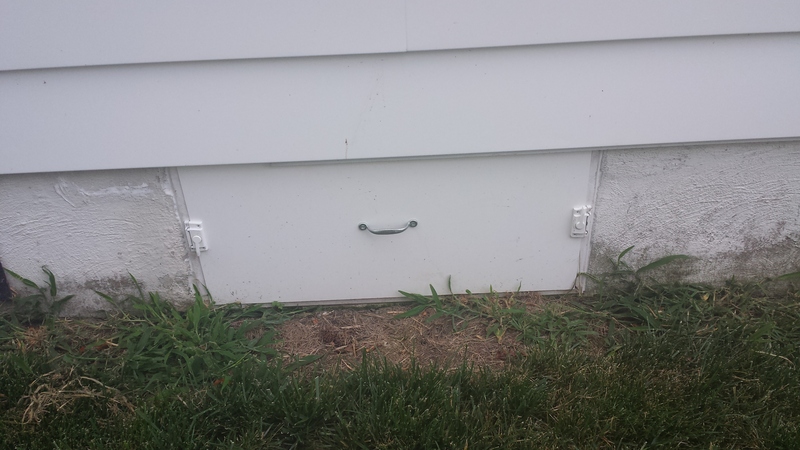 Thus, preventing termites from traveling from the ground upward either inside the foundation blocks themselves OR using the side of the foundation block which face the interior of the crawlspace. Notice the cooper termite shield in the picture. It is important to have a termite shield be it: Copper, Steel, Aluminum etc. A. Does it go-up against the sides of the foundation? 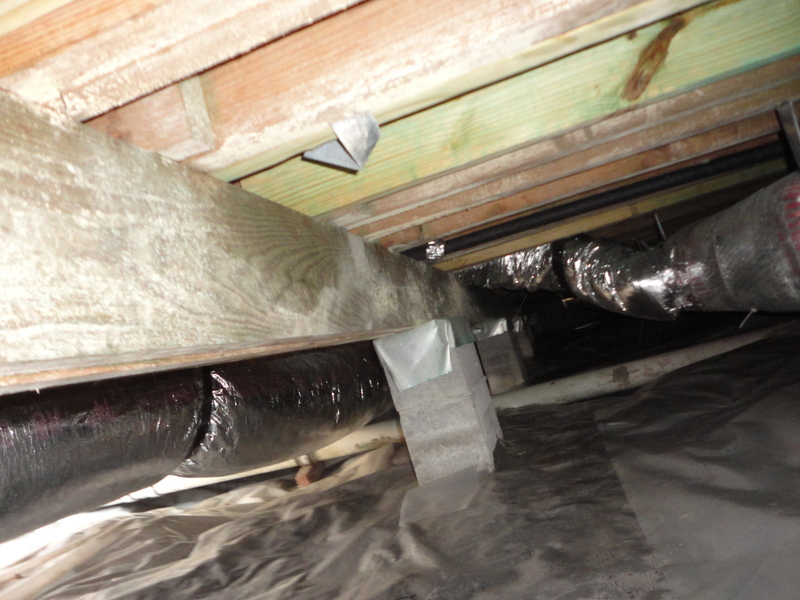 An important consideration if your crawlspace is prone to flooding. After all, if water gets on top of the mat you can either: Poke-holes in the mat [bad idea as now you have created holes for termites/insects to get in] and let the water drain OR buy a Submersible Utility Water Pump from a local hardware store [it isn’t designed to be permanent; you must plug it in so have extension cords; it will use a garden hose to siphon the water out]/use towels to mop-up the standing water. Alternatively, you can buy a bunch of cheap “crawlspace” towels from your favorite thrift-shop. B. Old moisture-mats are taken OUT prior to placing new moisture-mats. You do not want to trap water between layers of plastic. C. If multiple moisture-mats are used to cover the crawlspace waterproof tape or some other kind of durable and waterproof adhesive is used to seal any overlapping between the mats. D. Landscape Fabric Stakes/Pins are used to fix the mat to the ground. 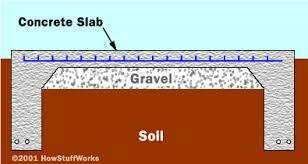 A fixed moisture mat is convenient because it does not move when you have to get into the crawlspace to do work. 3. Make sure your crawlspace is accessible. A human-sized opening is helpful for when you need to drag tools, lumber etc. into the space. 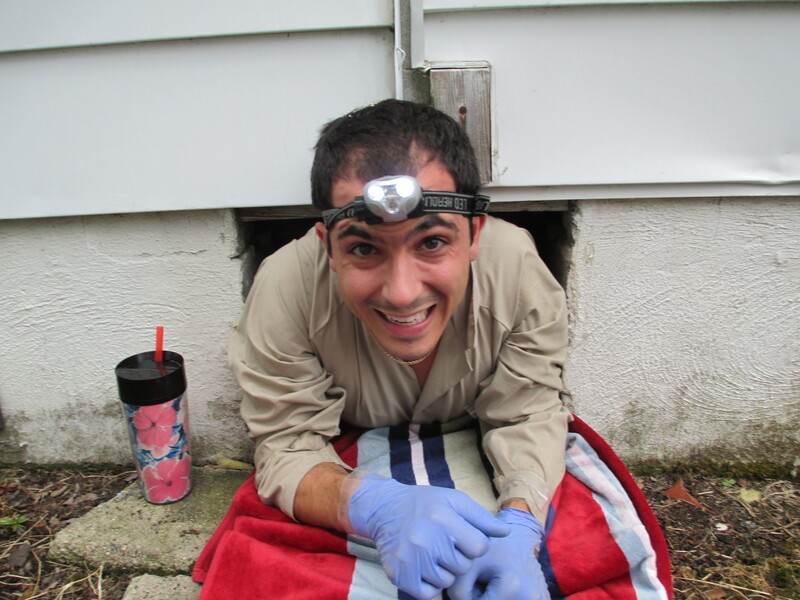 This is me coming out of the “Spider-hole”, a nick-name I gave my crawlspace. The opening was 10.5 in. in length and 9in. in height. The access-panel itself was made of wood (a handyman special) and was not secured to the hole. I would just prop it up. Here is the new opening: 18in. in length, 9in. in height, and easily detachable with side-clips. The only thing I regret is that I didn’t consider a method of LOCKING the space. Locking is good as it secures the space against thievery (like all those cooper water pipes) BUT if contractors need to access it while you are away it makes it difficult. B. Headlamp lite for extra light. I also carry a medium-size mag-lite flashlight which doubles as a probe for large areas (good for knocking down cobwebs) and as an insect-smasher. C. A digital camera to take pictures if needed. D. Gloves, any pair works but I prefer gloves that are flexible and easy to slip on and off. That way I can use my hand or fingers to better feel for wetness/identify substances. Latex gloves are fine for one-time uses but if you need to get into the crawl many times you need something more longer-lasting. E. A large-length screw-driver for probing into smaller areas. F. A pair of mechanics overalls to hold all my gear and cover my entire body (thrift store!). G. I normally wear a pair of junky tennis/yard shoes though a pair of study work-boots would be much better (probably can get a pair at a thrift-store). H. I don’t take my phone into the crawlspace as I am worry I will drop it or get it wet. I. I also inform my wife that I am entering the crawl and will shout if I need anything else. 5. Whether to encapsulate or not. When controlling air flow in the crawlspace you essentially have 3 options: Vents only, Vents with Power Foundation Fans, Encapsulation. 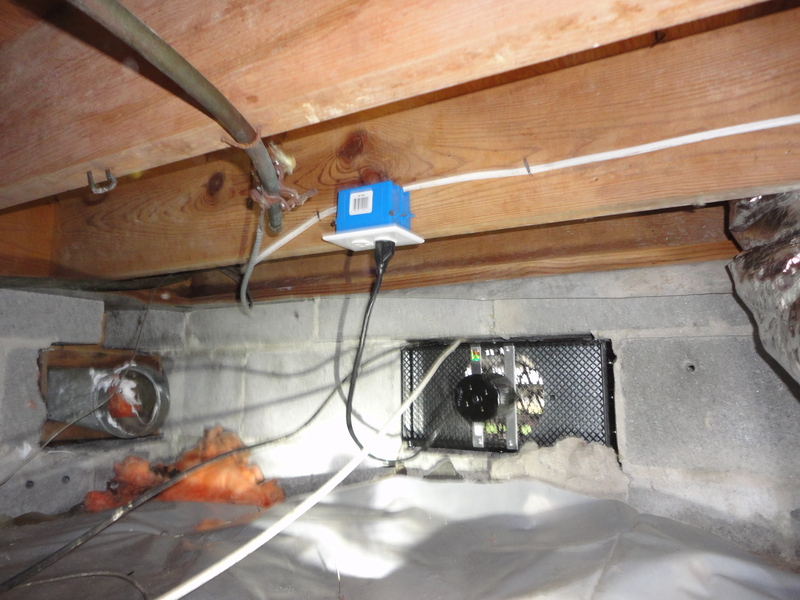 Encapsulation is when your block your crawlspace vents, extend the vapor-barrier completely up the wall, add a heavy-duty dehumidifier and/or a sump-pump. 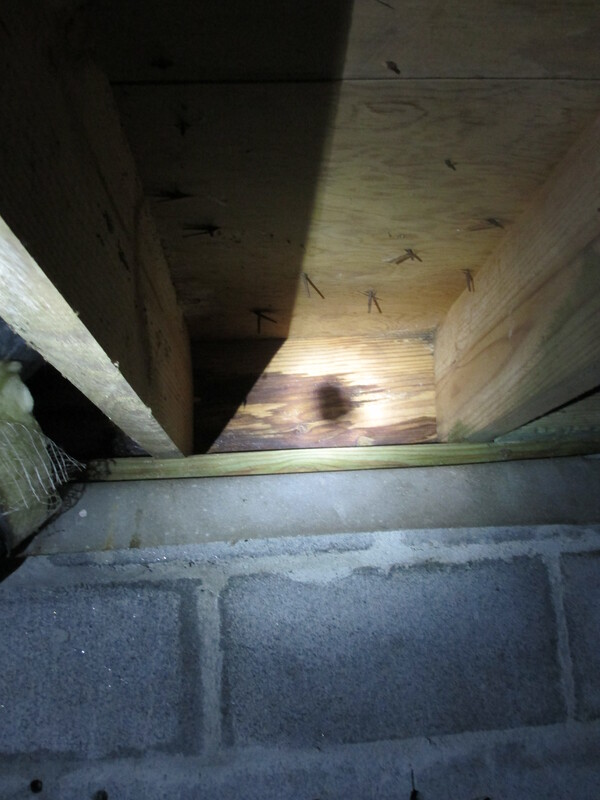 In essence you treat your crawlspace as an additional room of your house (but on a separate system) to ventilate. Encapsulation can be very expensive and labor-intensive but will control and prevent mold, condensation, and mildew from forming. 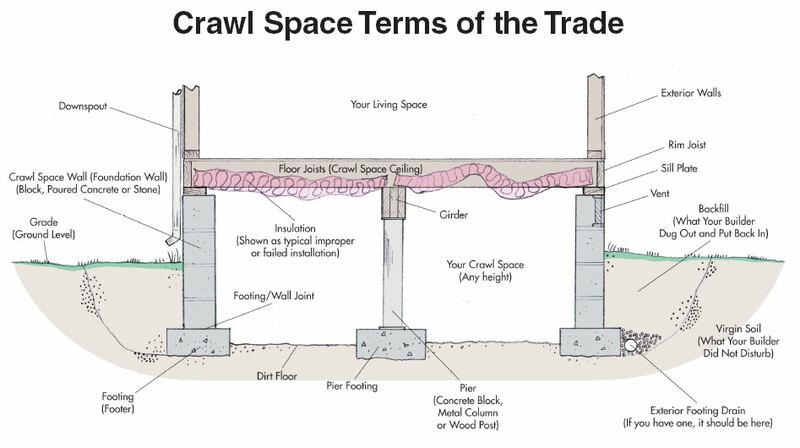 Crawlspaces.org does a good job at explaining the science, research, and technical aspects of crawlspace encapsulation. My wife and I opted for a middle-approach in which we had power-foundation fans installed, electrified, and hooked-up to a humidstat, which automatically turns the fans on when a certain level of humidity is reached. Our humidstat was provided by TempVent. Dominion Power also has a technical article that provides some further advice for those that take a middle-approach: Crawlspace Moisture Control, namely ensure that the slope grade away from the foundation is at 5% and consider methods such as extending gutter-downspouts into the ground and using corrugated black-plastic drain tubes to flow water away from the foundation, terminating in a french-drain. However, if you chose the middle-approach be aware that the power foundation fans are not perfect and you will still have to deal with condensation and mold. 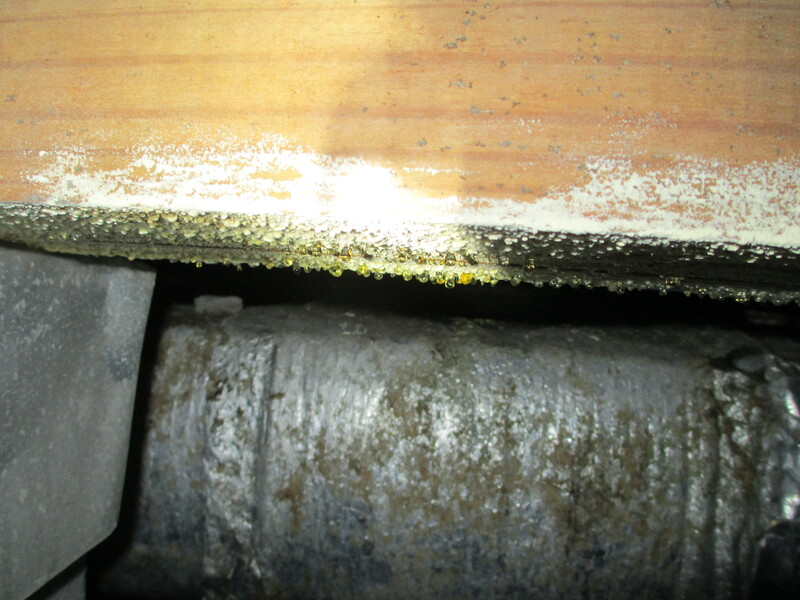 Condensation droplets on joists [Note: ductwork shown in picture has since been replaced]. Mold (active or inactive) can be treated with a Borate Treatment either by yourself or a professional. I normally do a yearly treatment. Though, it does given your crawlspace a smurf-blue color.